Drew Karpyshyn second novel from the SWTOR Universe has been revealed and set for release November 2012. The book’s title is, Star Wars: The Old Republic: Annihilation. The announcement was covered on a community news blog on the SWTOR official site. The cover art was also revealed for the novel. Before I go on, I want to warn everyone that there are spoilers in the following link to the official announcement. I will try to give some details without spoilers below and with that on with the summary. The book will be loosely based on events past Act 3 in the Star Wars: The Old Republic MMO. The primary character is Theron Shan. He is a descendant from Revan’s bloodline, but not a Force user. He is a “secret agent” working for the Republic Strategic Information Services. I find having a non-Force user a great idea for a book in the SWTOR Universe. Although I have not read the book yet, I find myself picturing a character with attributes of Han Solo, fast thinking, handling a blaster and not shying away from a fight, but also maybe some of Leia’s ability to be a diplomat, sometimes placing his duty to the Republic above anything else. Now whether or not that is who Theron turns out to be like, we will have to wait till November later this year to find out. I’m sure some of you may have seen a picture of this computer case mod. When I saw it I was blown away, not just by the fact it was Star Wars related, but the fact of fitting all the components into this unique structure. 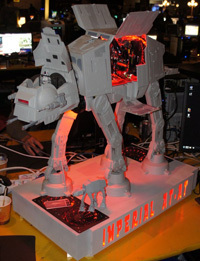 Ah heck who am I kidding, it is AT-AT computer case!!! It doesn’t get much cooler. The details of the computer components can be found in the following article link on IGN.com and for more images and information on the computer mod and even others the creator is working on, check out this link. Once you are on the site click on one of the pictures to begin the photo slideshow. Be sure to check out some of the other sci-fi inspired designs by clicking the links found near the top of the page. Well folks, Dulfy is at it again and that can only be more goodness for us! She has heard the cries for those wanting to see more images of vanity items like clothes/armor, thus we have TOR-fashion, so there is a new link to check out. Presenting her latest endeavor for your viewing pleasure, the complete high res catalog of SWTOR speeders. No more buyers remorse on that speeder my friend. You now have a source to check out exactly what that new ride will look like before laying down all those credits…Now my friend what do you think you would have to pay for a service like this? 100k in credits…no, maybe 50k in credits…wrong again, this remarkable service is absolutely FREE! Yes, folks that’s right I said free. So hurry and check out Dulfy’s SWTOR speeder catalog today, you’ll be glad you did. I don’t know about you, but after a long weekend I always feel like I’m behind. This week is no exception, in fact I have had trouble keeping up with some podcasts and articles. If this is happening and you are trying to catch up on Corellian Run Radio articles, we have them listed below for your convenience. Please take some time to let our writers and podcasters know what you think by leaving a comment in their articles. Level 50 PvP missions now grant 100 Warzone Commendations for daily missions and 300 Warzone Commendations for weekly missions. We apologize for any confusion. The new change to the PVP rewards was left off the original patch notes and now has been added, as Amber explains above. Be sure to read through all the patch notes and if something isn’t working as the note says create a ticket to notify them of the issue. Since the topic of the new looking for group tool seems to be the hot topic, let’s look at a song by Richie Branson and video by Hastings from swtorextreme. The song is entitled “LFG (Looking For a Group). Check it out and here is hoping we all get this tool in-game soon and cure these issues of grouping. That is it for this week’s HoloNet Links. Please leave us your thoughts in the comment section below. Is there a particular link, story, video, or topic related to SWTOR you would like us to highlight? If so please send them to us here at Corellian Run Radio and it might just be included in a future article. You can email us at corellianrun@gmail.com, or you can leave link suggestions in the comments below, or in the Facebook group. Thanks and see you all next week!